Cabela’s Fleece Pants ($20 – $80). A range of options here, including a sweet 300-weight style. Campmor also has a huge selection of discounted fleece pants. 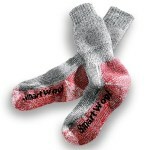 These are the pinnacle of the ultra-cush, ultra-warm, and ultra-durable sock world. They’re also spendy at more than $20 per pair, which makes them a great gift since few people I know will spend that much money themselves on a single pair of socks. The rare gift that people put on the second they come out of the wrapping paper. Widely available. Powerstretch Tops and BottomsPowerstretch is wonderful stuff and makes for the warmest, best-fitting base layer fabric I’ve yet discovered. It’s four-way stretch provides an excellent form-fit while allowing a full range of motion, while its soft fuzzy fleece lining is luxurious against the skin. The best collection for the 2010 holidays comes from the EMS Powerstretch Assortment ($80 – $100).